Now available: annual bibliographies starting in 1960, 1970, 1980, 1990, and 2000. See also: 2006, 2007 and 2008 and 2010. BJF, 2008-9, illustrated presentations aboard the Cunard: M/V Victoria, Caribbean Celebration cruise. Amazing Menu of Tomorrow, Royal Court Theatre, 1000-1045h, 12 December. The World's Worst Cruise Vidoes, and How not the Make One, Royal Court Theatre, 1215-1300h, 14 December. Secrets of the Christmas Snowflake, Royal Court Theatre, 1000-1045h, 18 December. The Science of Christmas, Royal Court Theatre, 1000h-1045, 26 December. Don't let them steal your Identity, Royal Court Theatre, 1030-1115h, 1 January 2009. [See also Cunard Daily Programme: p1, 12 December; p1, 14 December; p2, 18 December. Book signing at 1500h on 16, 18 December]. Sailing: Southampton, Ponta Delgada, Azores; St John's, Antigua; Basseterre, St Kitts; Castries, St Lucia; St George's, Grenada; Bridgetown, Barbados; Funchal, Madeira; Vigo, Spain; Southampton. 11 December 2008-2 January 2009. BJF, 2009, reviews Science for Primary School Teachers by Helena Gillespie, Rob Gillespie, Open University Press, [in] Journal of Biological Education 43 (1). King, Meggan, 2008, photograph of Brian J Ford with Nobel laureate Dr Osamu Shimomura, The Microscope 56 (2): 52. BJF, 2009, The e-learning Imperative The Microscope, 56 (4): 163-172. Magical Memories, Cinema Theatre, 1000-1045h, 20 February. Cruising into Futuristic Food, Cinema Theatre, 1115-1200h, 23 February. How the Internet Robs your Identity, Cinema Theatre, 1000-1045h, 25 February. The Secret Language of Life, Cinema Theatre, 1415-1500h, 27 February. Miraculous World of the Microbe, Cinema Theatre, 1530-1615h, 6 March. Worst Cruise Videos - and how Not to Make One, Cinema Theatre, 1600-1645h, 07 March. [See also Scientist, Writer and Broadcaster Professor Brian Ford, Saga Ruby Today: 2, 5 March]. Sailing Mombasa, Kenya; Port Victoria, Seychelles; Aqaba, Jordan; Safaga (for Luxor), Egypt; Sharm el Sheikh, Egypt; Port Suez (for Cairo), Egypt; Suez Canal, Egypt; Piraeus (for Athens), Greece. 17 February - 8 March. Pearson, Mark, 2009, New bus shelter officially opened, Peterborough Evening Telegraph, 18 February. BJF, 2009, reviews Animal Intelligence, from Individual to Social Cognition [in] Biologist 65 (1): 61. Elworthy, John, 2009, Anger over hall refusal (report on the deniual of planning permission for the Eastrea Centre), Cambs Times: 7, 20 February. Report, 2009, Centre funding 'thrown away', Cambs Times: 5, 20 March. The Beeches Primary School, Beeches Road, Peterborough, 3 April. Report, 2009, April Fool's prank came true, Peterborough Evening Telegraph, 7 April. BJF, 2009, discussion of cell intelligence (etc) with Alain de Botton and Paul Fornel [in] The Forum, BBC World Service (recorded 8 April), 0900-1000h, 12 April. 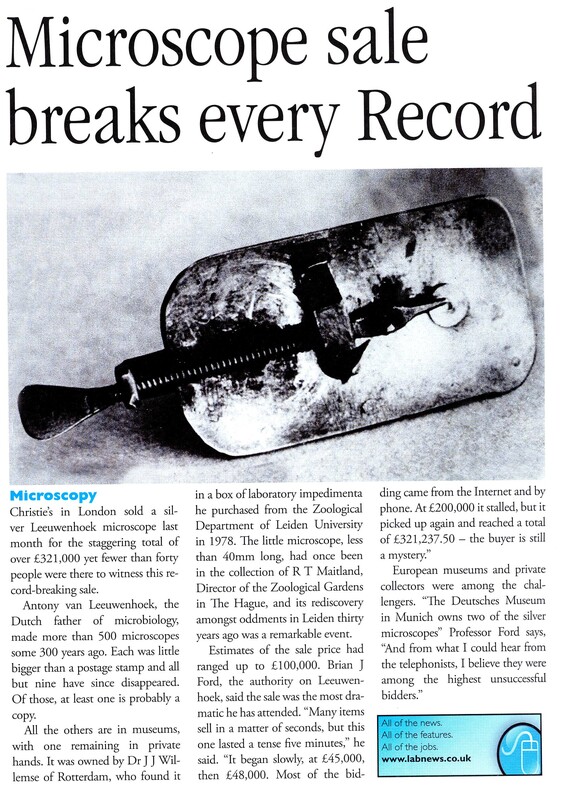 Report, 2009, Microscope sale breaks every Record, Laboratory News: 6, May [see online version]. 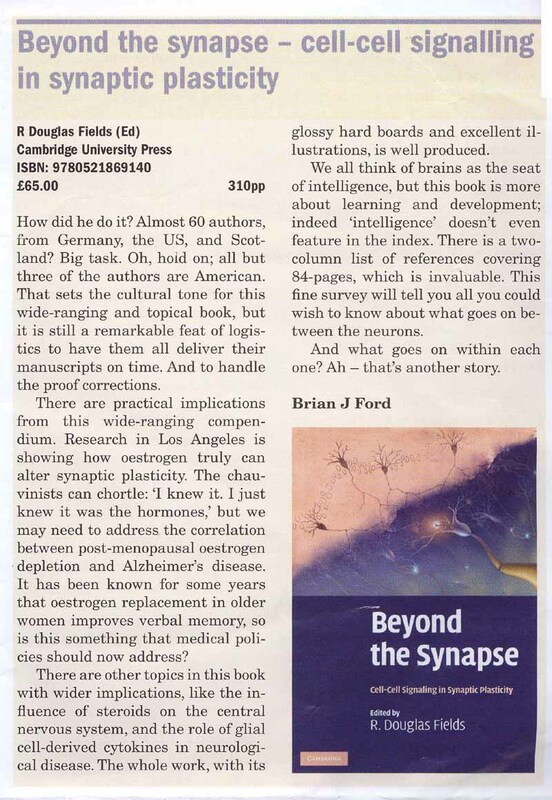 BJF, 2009, review of R Douglas Fields (ed) Beyond the Synapse, cell-cell signalling in Synaptic Plasticity, Biologist 56 (2): 121, May. BJF, 2009, illustrated presentations aboard the Cunard: M/V Victoria, V 905 Mediterranean Treasures cruise. Fun and Games in the Public Eye, Royal Court Theatre. 1. Can science change the earth's heat cycles? 2. Is 'global warming' a myth to regulate mankind? 4. Is superconductivity possible at room temps? 5. Can DNA be altered to stop ageing? 6. Since ice is frozen water, why does it float? 7. If apes are our relatives, why can't they be house trained? 8. Why is fruit unripe when delivered to the shops? 9. Will there be a pandemic of swine flu? 11. What are stem cells? 12. Is there likely to be a Yellowstone eruption? 13. What medical progress will there be in the next few years? 14. The green flash . . . What's the science? 15. What fills the void when we extract oil and gas? Royal Court Theatre. Secret Language of Life, Royal Court Theatre. What the young don't know about Facebook, Royal Court Theatre. The Truth about GM Crops, Royal Court Theatre. Sailing: Vigo, Spain; Lisbon, Portugal; Palma, Majorca; Barcelona, Spain; Cannes, France; Civitavecchia (for Rome), Italy; Ajaccio, Corsica; Gibraltar. 6 - 20 May 2009. 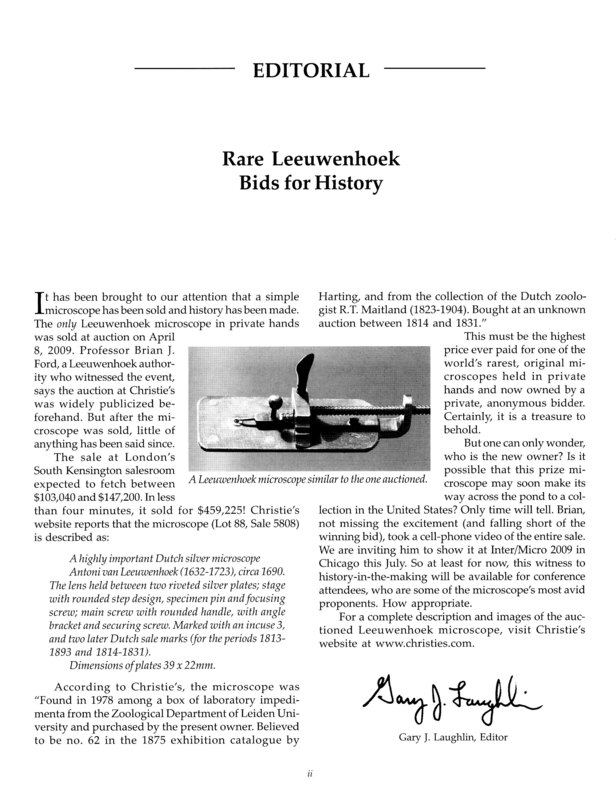 Laughlin, Gary, 2009, Rare Leeuwenhoek bids for history, The Microscope 57 (1): ii, June. BJF, 2009, interviewed by Faye Southwell for BBC Cambridgeshire Television breakfast programme news, 0735, 0755, 0835, 0855h, 11 June (video in archive). 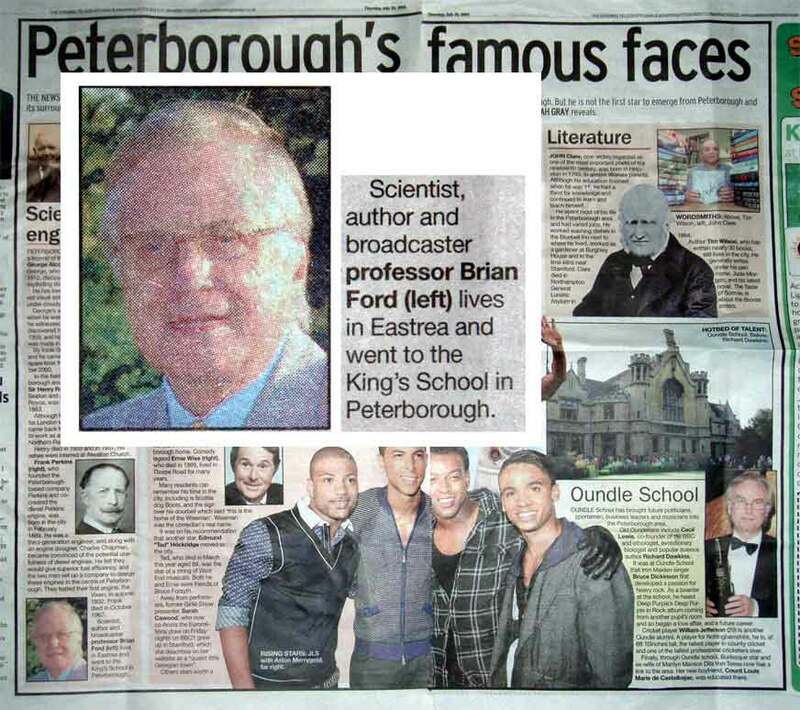 Feature, 2009, Free-thinking Brian is not one for playing by the rules when it comes to science, Peterborough Today on-line, 17 June. 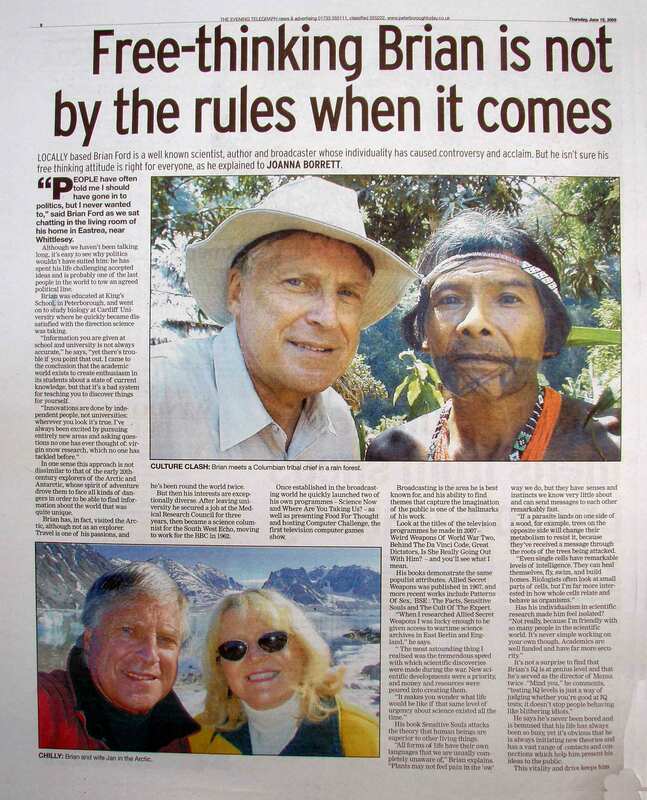 Borrett, Joanna, 2009, profile interview with Brian J Ford (with colour photographs) page 1, page 2 Peterborough Evening Telegraph: 8-9, 18 June. BJF, 2009, interviewed by Antonia Bricknell on MP's expenses and censorship, BBC Cambridgeshire Drivetime show, 1750-1755, 18 June (video copy in archive). Jackson, Tom, 2009, Under Fire (report on planning inspector), Cambs Times: 34, 19 June. BJF, 2009, review of The Elements of Library Research, by Mary W George, Journal of Biological Education 43 (3): 140. BJF, 2009, Review of Jordan's Modern Law of Meetings, New Law Journal: 1002, 10 July. Bonk, Curtis, 2009, Faster than a Ford? [in] The World is Open: 65-69, San Francisco: Wiley Jossey-Bass. 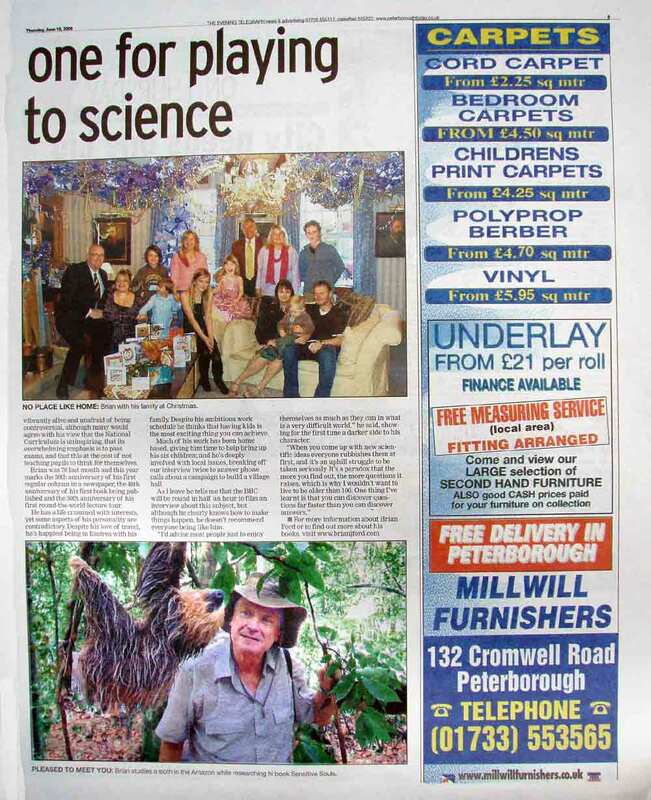 Gray, Hannah, 2009, Peterborough's Famous Faces [with colour photograph of Brian J Ford] Peterborough Evening Telegraph: 8-9, 30 July. BJF, 2009, Did Physics matter to the Pioneers of Microscopy? [chapter for] Advances in Imaging and Electron Physics 158: 27-87, Editor Professor Peter W Hawkes, New York: Academic Press. [See also illustrations from the Science Direct web site. 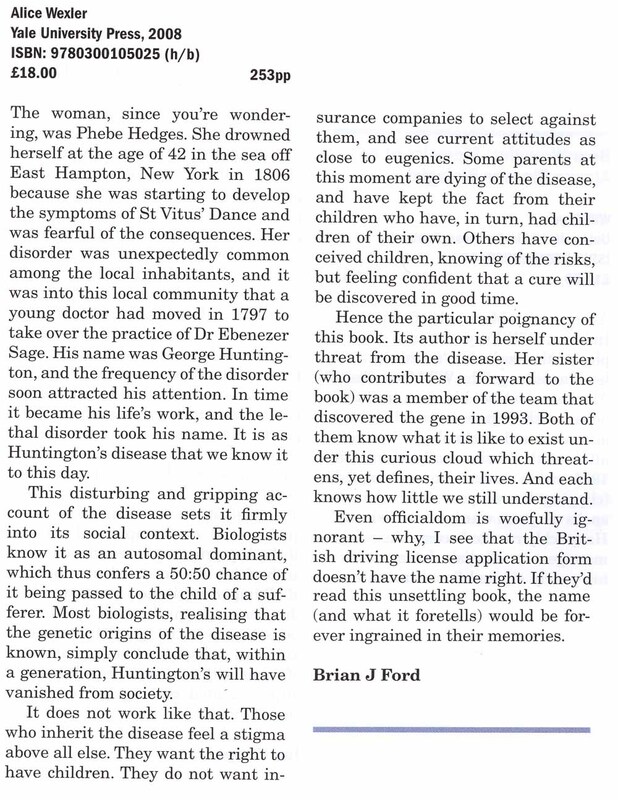 BJF, 2009, Reviews The Woman who Walked into the Sea, by Alice Wexler, Biologist 56 (3): 188-189, August. 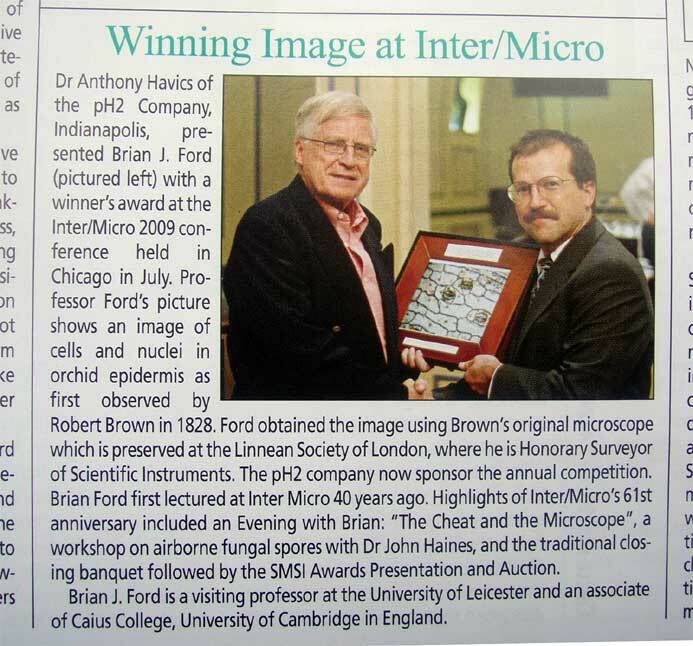 BJF, 2009, Charles Darwin and Robert Brown – their microscopes and the microscopic image, Infocus 15: 18-28. BJF, 2009, extracts from BSE, The Facts (1996) in Academic Vocabulary for Intermediate Students: 194-205, Tokyo: Kzai Co Ltd.
Report, 2009, Brian J Ford wins award for micrographs with Robert Brown's microscope, Inter Micro 2009, Microscopy and Analysis. Silva, João Alcindo Martins, 2009, paper reproducing micrographs of erythrocytes obtained with Leeuwenhoek lens, and microscope image [in press]. BJF, 2009, Early Days of the Microscope, illustrated presentation to West Sussex History of Medicine Society, St Richards Hospital, Chichester, 1100-1200h, 17 October. BJF, 2009, Plagiarism in Science, Presidential address to Cambridge Society for the Application of Research, Churchill College, University of Cambridge, 1900-2100h, 19 October. Report, 2009, Brian J Ford on the BBC in 'Do cells think? ', report by Institute of Biology, 22 October. BJF, 2009, illustrated presentations aboard the Cunard: M/V Victoria, Wonders of the Mediterranean cruise. Revealing the Truth about GM Crops, Royal Court Theatre, 1215-1300h, 8 November. How Animals think, and Plants take Decisions, Royal Court Theatre, 1215-1300h, 9 November. What you neet to know about the Internet, Royal Court Theatre, 1100-1145h, 19 November. Fun and Games in the Public Eye, Royal Court Theatre, 1000-1045h, 21 November. You Coose the Topic - Science by Request, Royal Court Theatre, 1215-1300h, 22 November. See also Scientist, Writer and Broadcaster Professor Brian Ford, Queen Victoria Daily Programme: 2, 8 November]. Sailing: Malaga, Spain; Palermo, Sicily; Dubrovnik, Croatia; Venice, Italy; Split, Croatia; Corfu, Greece; Gibraltar. 7 - 23 November 2009. BJF, 2009, On Intelligence in Cells, the case for Whole Cell Biology, Interdisciplinary Science Reviews 34 (4): in press. 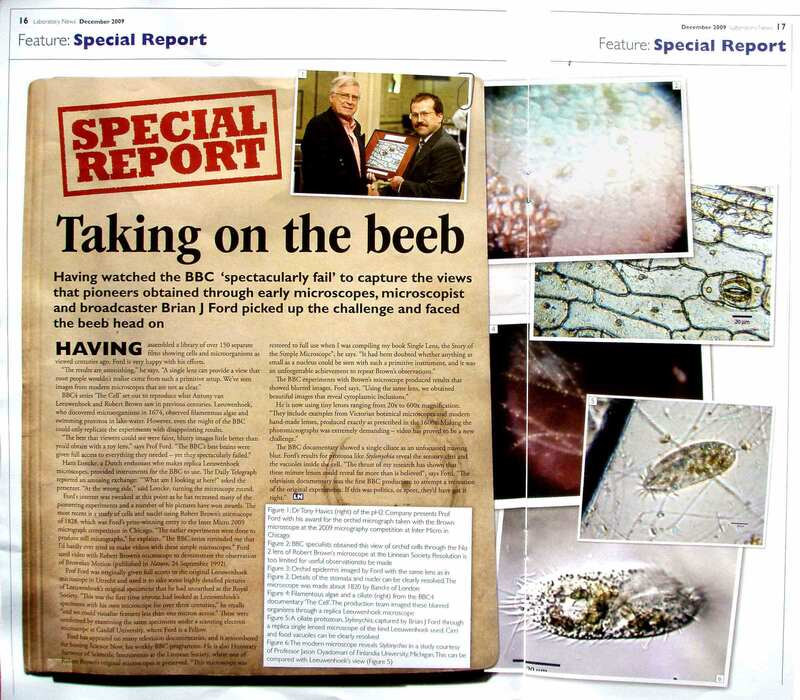 Prime, Phil, 2009, Taking on the Beeb (with colour photographs), Laboratory News: 16-17, December. BJF, 2010, Culturing Meat for the Future: Anti-death versus anti-life, [chapter in] Tandy, Charles (editor) Death And Anti-Death, Volume 7, Palo Alto: Ria University Press. Move to following year, 2010. Return to previous year, 2008.